The Future of FPGA Prototyping! Fastest SoC time-to-success: emulators, or FPGA-based prototypes? Should there be a 5-second IoT chip rule? In our quest to further enlighten the masses SemiWiki has published four books, we have two more eBooks in post production due out in Q1 2018 and two more topics in research. All of the books are available free for PDF versions or you can get printed versions on Amazon.com or free printed versions at book signings or if you happen to meet me during my travels. Our first eBook Prototypical is experiencing a resurgence of popularity do to the increase in design starts around the world from non traditional semiconductor companies. Using FPGA prototyping you can get to proof of concept in a short amount of time and a minimal upfront investment so if you are an emerging company or entering an emerging market this book would be a good place to start, absolutely. The first half of “PROTOTYPICAL” is a concise history of FPGA-based prototyping. We go back to the beginning, briefly introducing the debut of the Altera EP300 in 1984 and the Xilinx XC2064 in 1985. We then discuss the tipping point for what would become FPGA-based prototyping: the introduction of the Quickturn Systems RPM in May 1988. Strictly speaking, the RPM was an FPGA-based hardware emulator, but it set the stage for a radical change in chip development methodology. Intel took the Quickturn technology and put the P5 microarchitecture through its paces on a 14-machine cluster, running a killer demo in 1991 and ultimately releasing the Pentium microprocessor in 1993. From there, while the large EDA firms scuffled over bigger and bigger hardware emulation capability, several academic teams started deploying FPGAs for reconfigurable computing and rapid prototyping. These teams were looking for lower cost ways to prove out algorithms and chip designs. It was during this period issues of FPGA interconnect and synthesis partitioning were uncovered and addressed – and just in time, as ARM7TDMI synthesizable cores appeared in 1997. We then launch into chapters with brief timelines of three of the major firms in FPGA-based prototyping: S2C, Synopsys, and Cadence. We close the first half with a look at where FPGA-based prototyping is headed, including how it can help application segments such as automotive, wearables, and the IoT – three segments we believe will see an increasing number of design starts as new players seek to optimize and differentiate their software through chip design. 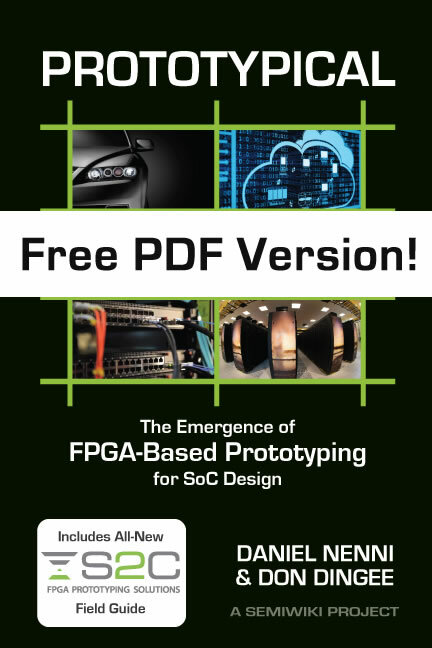 The second half of “PROTOTYPICAL” is an all-new Field Guide titled “Implementing an FPGA Prototyping Methodology” authored by the teams at S2C. It looks at when design teams need an FPGA-based prototyping solution, how to choose one, and how to be sure the platform is scalable including a look at the latest cloud-based implementations. It then dives into the methodology: setting up a prototype, partitioning, interconnect, debugging, and exercising a design. It’s a practical view of the questions teams have and the issues they run into, and how to solve them. When Do You Need an FPGA-based Prototyping Solution? How Do I Choose Which Solution to Implement?